The lady on the phone sounded harassed. She was ringing to look for help with her 16-week-old puppy. No! You’re expecting far too little! I had to explain to this caring owner that she was asking too little of her puppy, and instead of giving him the chance to grow, she was keeping him a baby. With the exception of the jumping up, which can take longer (more anon), all of these things should be resolved by 10-12 weeks. And the longer you leave it, the more you have to undo! That’s why I welcome puppies at Puppy Class from 9 weeks of age. And my own puppies are learning from the moment they come through the door - at 7 or 8 weeks. When your puppy first arrives, it’s very simple to lay down the ground rules. He’s tiny, a bit anxious, eager to please, ready to learn, bursting with enthusiasm, and he needs to sleep most of the time. What better time to start building a solid relationship of trust? Using a crate from Day 1 answers most of the problems this lady was having. If a crate is not possible, then at least have a puppy playpen or baby-gates. But a crate is best and will establish firm boundaries for the future. 2. Always wait till he’s stopped bouncing before you open the crate door - you may need to walk away from the crate and come back a good few times before he realises that staying still opens the door, but bouncing keeps it shut. Then greet him at his level as he emerges while you clip the lead on and whiz him out to the garden for a pee. 3. He can’t destroy anything if he’s in his crate with his chewtoys at those times when you can’t be actively supervising him. Bliss! Remember he needs oceans of sleep. If he’s been awake for an hour you’re back to No.1 above. I don’t know why I sometimes meet resistance to the use of a crate. Most parents will use a cot for their baby or toddler to ensure that she’s safe and secure when left alone. The crate is the exact same thing for a puppy. There is no hint of punishment. So, just as with your baby, put the puppy in the crate, shut the crate door, and leave the room. He’s safe. He can sleep. A well-reared puppy is unlikely to soil his bed. You can relax and do something else for a while. And know that you’re putting your puppy on the path to becoming a Brilliant Family Dog right from the start. If you can make a connection with your dog, you can build trust, understanding, confidence. Chewie waits patiently instead of jumping up to steal the food! *What course is Scott talking about? 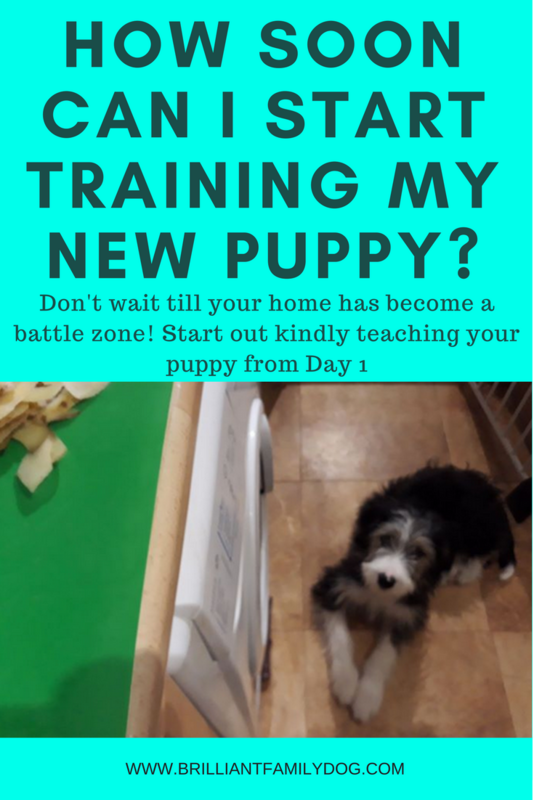 Our new online Puppy and Dog Courses! Want to join us and get results like this? Yes - as you can see above, you CAN learn all this online, and transform your life with your dog. The course is now open for enrolment and you’ll be able to check out the course for yourself before jumping in. Got an older dog that you need a bit of help with? There’s also a course specially designed for the dog just out of puppyhood.